SPRINGFIELD – State Senator Steve Stadelman (D-Rockford) joined with both Republicans and Democrats to pass a fully balanced state budget. Under the budget proposal, which passed the Illinois Senate today with a vote of 56-2, the state finally delivers on a grant promised to pay for the Rockford Airport a few years ago. While the airport is already built and paid for with private loans, the governor froze the grant from previous budgets. School districts will also receive an additional $350 million. Due to last year’s historic school funding formula reforms needier school districts, including Rockford Public Schools and Harlem School District, will receive a significant increase. This year’s budget also increases funding for local governments by $120 million. “These additional dollars for local governments will prevent a property tax increase and layoffs of first responders,” Stadelman said. The budget proposal will now head to the Illinois House of Representatives for further consideration. 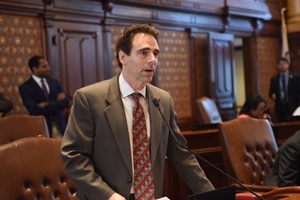 SPRINGFIELD – State Senator Steve Stadelman (D-Rockford) passed a proposal in the Illinois Senate to seek solutions for skyrocketing credit card debt faced by college students. While credit cards can be useful for students to purchase school supplies and pay for tuition, students run the risk of running up significant balances that take years to pay down. According to the U.S. Department of Education’s National Center for Education Statistics, in 2016 41 percent of students graduated with credit card debt averaging $3,000. Stadelman’s proposal, House Bill 4710, creates the College Student Credit Card Marketing and Debt Task Force. The task force will be composed of representatives from credit unions, banks and state universities. The issues it will study include how credit cards are marketed to students, students’ payment history and several other related issues. Stadelman’s proposal passed the Illinois Senate with a vote of 54-0. It has now passed both chambers of the Illinois General Assembly. 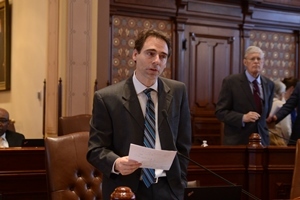 SPRINGFIELD – To help combat recent reports of drug price gouging in Rockford, State Senator Steve Stadelman (D-Rockford) today voiced support of a proposal that will prohibit drug manufacturers and wholesale distributors from drastically increasing the price of generic medications. 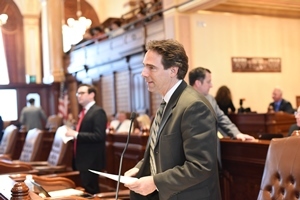 Stadelman, who is a co-sponsor of House Bill 4099, was joined by colleagues from the Illinois House and Senate, as well as representatives from the NAACP and AARP. According to recent news stories, Mallinckrodt Pharmaceuticals Inc. increased the price of a vial of Acthar, a prescription to treat babies suffering from a rare seizure disorder, from $40 to $54,000 per vial. The city of Rockford, which is self-insured, was forced to pay nearly $490,000 when two babies of city employees needed the vital prescription. Under the proposal, companies that increase prices of generic or off-patent drugs by more than 30 percent in one year, 50 percent in three years or 75 percent in five years, could be forced to pay a fine of $10,000 per violation. The legislation is currently in the Illinois Senate Subcommittee on Business Subcommittees. SPRINGFIELD – With the increase of cashless tolls in Illinois, State Senator Steve Stadelman (D-Rockford) advanced a proposal that offers protection for rental car drivers. After returning a rental car, many drivers may be surprised to find they were charged additional fees for a tollway collection device, similar to an I-PASS. Stadelman advanced a proposal through the Illinois Senate this week to allow rental car drivers to opt out of these devices. “Drivers deserve to be aware of the option to use these costly tollway devices up front, instead of finding out about these costly fees later,” Stadelman said. Under Stadelman’s proposal, rental car companies must provide renters the option of using the tollway collection device. If a company fails to offer a customer the ability to opt-out, the fees are capped at $2 per day that the device is used, in addition to the cost of the tolls. Stadelman’s proposal, Senate Bill 2522, passed through the Illinois Senate with a vote of 49-0. It will now head to the Illinois House of Representatives.